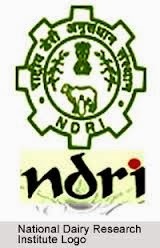 About Organization: The National Dairy Research Institute as country's premier Dairy Research institution has developed considerable expertise over the last five decades in different areas of Dairy Production, Processing, Management and Human Resource Development. How to Apply: WALK-IN-INTERVIEW for the position will be held at NDRI, Southern Campus, Adugodi, Bangalore-560030. Interested candidates can send their biodata to Dr.K.P.Ramesha, principal investigator & in charge, Dairy production section, Southern Campus, NDRI, Bangalore.